Remember that hugely successful petition last fall that helped get Deal officials to table the vote to restrict parking along beachfront roads? Click to see more. Well a similar ordinance is back on the table in Deal and we need your help to push back against this illegal ordinance. Please show up to the Deal board meeting tomorrow 6/29 at 5pm to respectfully protest restrictive beach access. The Borough of Deal is planning on introducing Ordinance 1134 on Wednesday to issue permits for resident parking along one side of Hathaway, Neptune, Sydney, Deal Esplanade, Darlington, Ocean Lane, Monmouth Drive, Monmouth Terrace and Roosevelt. The time restraints last from 8 AM to 8 PM, Thursday to Sunday and holidays. Please attend the meeting on Wednesday (6/29) at 5:00 PM at Borough Hall. There will be a public comment period at the end of the meeting. 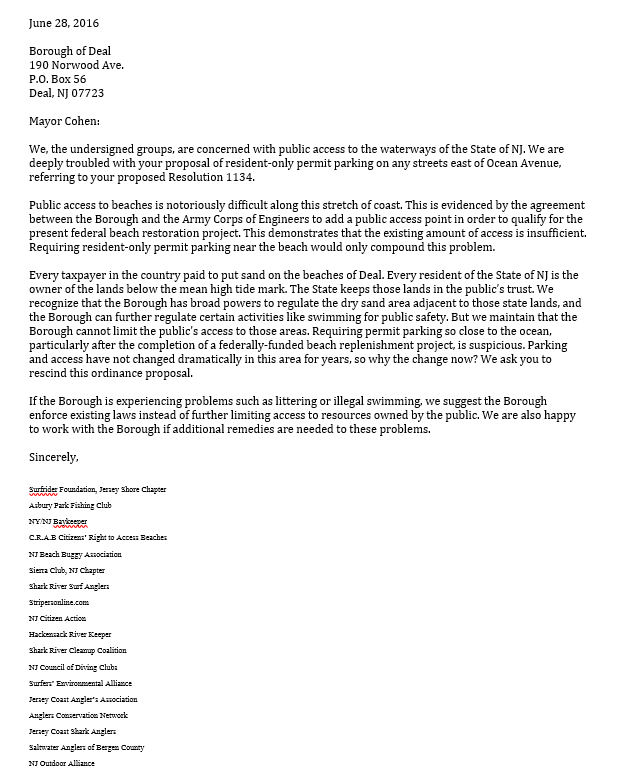 The permit parking legislation is yet another attempt to legalize restriction to the borough’s public beaches. A similar ordinance was tabled in October. Deal is among the last Monmouth County community to undergo beach replenishment post Hurricane Sandy. The Army Corps of Engineer supervised the $40 million project that pumped 1.4 million cubic yards of sand between Deal and Loch Arbour. Access and parking is a requirement of participation in the replenishment program.